April 20, 2014, Sunday. HAPPY EASTER! The Lord is risen! He is risen, indeed! The weather during holy week was very wet and cold but today is totally beautiful. 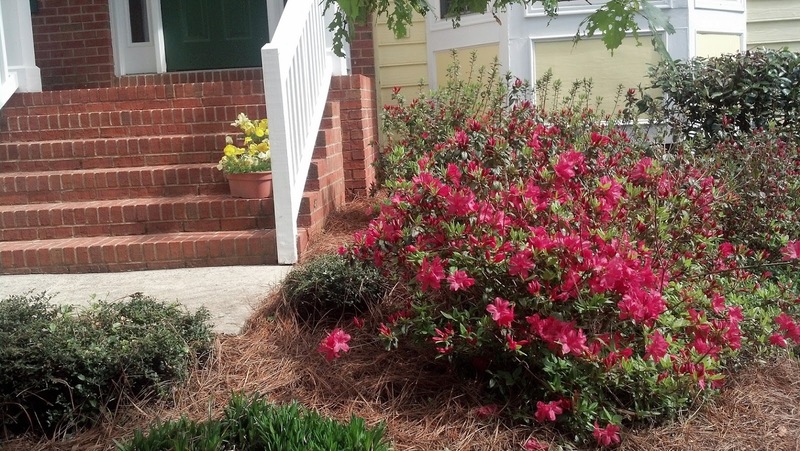 The azaleas and dogwoods are perfect and they beautify and glorify God for Easter. In this part of the country fall is colorful but spring is glorious! Everywhere you turn there is new life and rebirth. We had Easter dinner this afternoon at a neighbor's house with other neighbors that was most enjoyable and tasty! It was a time of sharing and fellowship and they wanted to show their appreciation before we move which may be sooner now as the sale of the house progresses. This week we will be doing some serious de-stuffing. We have to find someone who wants the remainder of our furniture and I have tools in the garage that I must find a home for. Some one at church recommended Graigslist but I am leery of that method; too much bad publicity. Some of it may just get busted up thrown out. For example ,we have a large 54" projection HD TV (one of the first HD models to come on the market 16 or 17 years ago) but it is so old I doubt anyone would want it. So we are going to have to think outside the box this week.